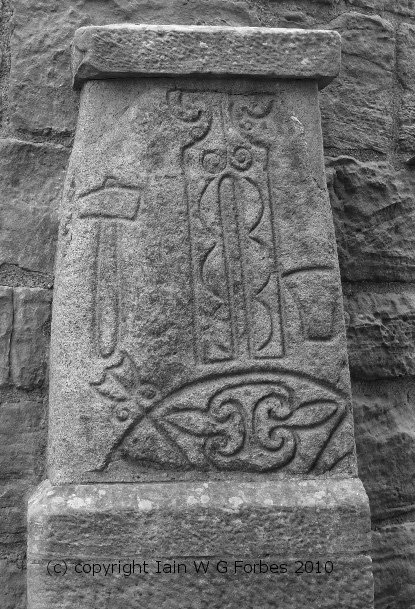 Pictish Symbol Stones are generally thought to have been carved between around 500AD to around 900AD. They are found all over modern Scotland, from the South West of Scotland to the Shetland Isles. While there are a few examples from the west coast and the Hebrides, the highest concentration is found in the East of Scotland, particularly the North East of Scotland. The symbols themselves are usually found in pairs (on un-broken stones), and can also feature the apparently subsidiary symbols, the ‘mirror and comb’. There are varying estimates of the number of symbols used by the Picts within the symbols pairs. While some estimates suggest up to as many as sixty symbols, more recent analysis suggests a more reasonable figure of around 28-40 symbols, . These appear in different combinations on around 350 stones. Symbols have also been found on silver objects, such as the silver plaques from the ‘Norrie’s Law’ horde and silver chains and it is possible that symbol pairs represented on other media which have simply rotted away. 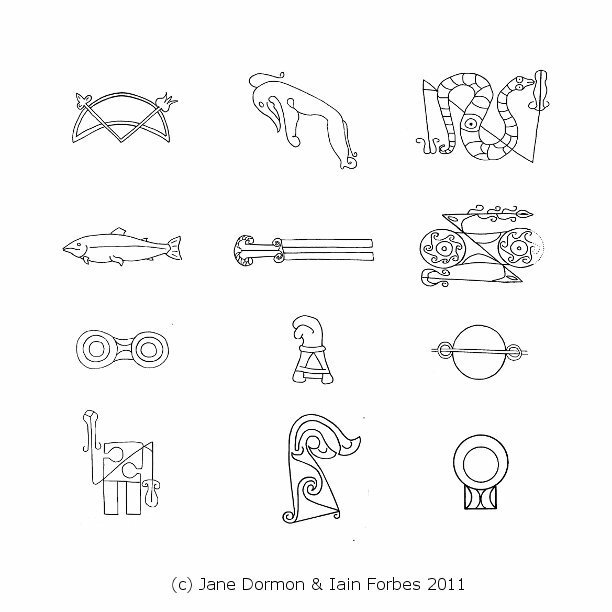 It is possible these symbols were painted or tattooed on the skin of Pictish warriors. The symbols found on Class I and Class II stones can be quite exquisite in their execution, created with great artistry and free flowing lines. This is particularly true of the some sixteen or so animalistic symbols. These include beautiful representations of lions, deer, wild boar, birds and fish and other creatures (real or imagined). These are reminiscent of the animal figures that appear in the Book of Kells and other religious illuminated manuscripts originating from the Celtic Church from the second half of the first millennium (although Class I stones probably predate these manuscripts). This has led to speculation on the input of Picts in the creation of these great art works – heightened by the strong possibility that the Book of Kells was probably created in monasteries on the west coast of Scotland. Parallels have also been drawn with other artefacts featuring animals from the burial site of an Anglo-Saxon king at Sutton Hoo dating from around 650 AD, as well as much earlier examples from Celtic artefacts. The seemingly abstract Pictish symbols that appear in pairings on hundreds of stones, number in the high twenties, and can be highly sophisticated in design and execution. It is possible that some represent particular objects that would have been recognisable to the population at large in Pictland but have been rendered in a two dimensional manner that makes them difficult to decipher as recognisable objects. In addition there are secondary symbols that are clearly depictions of inanimate objects which often appear alongside the principle symbol pairs, and usually take the form of a hand mirror and comb, or more rarely implements which may be related to the art of the blacksmith; including hammers and tongs and perhaps even the blacksmith’s anvil (see Abernethy stone below). The stones have been sorted into three classes; Class 1, Class 2 and Class 3. Class 1 stones are thought to be older in origin, with Pictish symbols incised into the surface of the stone. The stones themselves are rough and unworked. Some may have been originally neolithic stranding stones, reused by the Picts. They have no Christian symbolism present. 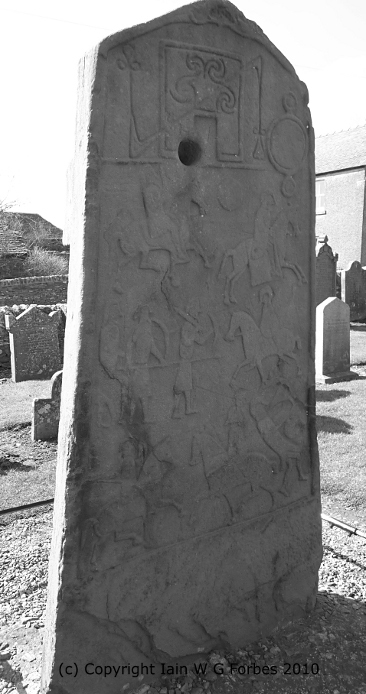 Class 2 stones generally have both Christian symbolism and Pictish symbols present. The stones are worked rather than rough, and the images are carved in relief, in contrast to the incised technique used in class 1 stones. Class 3 stones are Christian stones from the Pictish period, but with no Pictish symbols present. These symbols are fascinating. I’m sure they have plenty of stories to tell us when we learn to read them. I like the imagery on this blog. Thanks very much Rebecca, gald you enjoyed it! Hi Ian. I saw a documentary about ancient Egyptian stone carving techniques and they pointed out that even today stone masons in Egypt will use a tuning device and hammer to find cavities in stones so that they do not have a stone break apart on them during shaping and placement because it has a weak spot. They place the tuner against the stone and hit it and if it chimes there is a hollow area. That may be what is depicted on the first image. The most fascinating aspects of these ancient symbols is their dispersion around the globe throughout the many very differing traditional beliefs of various cultures, and the binding roots of the true meaning behind their origins, which can be easily spotted by those who have such understanding. In the diagram above, I can easily see the ancient symbols of the sacred eye, the ‘as above so below’ metaphors which have been perverted by witchcraft enthusiasts for the least few centuries, and the spirit and matter symbols, all of which have been dispersed through countless traditions and rituals over millennium. Prior to our historical suppositions of the ancient world, a lost history remains to be accurately unraveled, where only glimpses of what might have been are concealed in secrecy that almost seems deliberate. Civilizations of great stature, far beyond those of ancient Mesopotamia and Egypt, hide in intricate camouflage. Atlantis and Lemuria are spoken of in myths. The ancient Djedi are inaccurately associated with modernized reconstruction efforts of what today’s scientists would classify as druids, restricting them to one time period, because it is their only source of information about them, when in fact, it is far more probable that these mistaken druids of Celtic affiliation, are the successors of a far more ancient and global profession of harbingers, from which these many intercultural and international symbols originate. The Sacred Eye is now being realized by physic scientists around the world as the symbolic representation of the mating/sharing of two fields of consciousness, two circles combining together which form at their conjunction, the sacred eye, more commonly known as the vesica pisces. This sacred symbol is seen in the most ancient of artifacts. The area created by the conjoining of two circles/fields represents the unity of all things, as well as the sharing or experiences which evolve into higher understanding as it is shared. This original symbolic representation has given way to the many portals, gateways, and pathways to the otherworld experience being shared. The Spirit always represented with a circle, fire or eagle, and matter always represented by geometric shape, the serpent, and the correlation of the higher and lower designations between the two, are seen in the diagram, and many other ancient sources, which speak to an ascendance or heightening of knowledge and understanding, always joined together by some conduit, or the typical as above so below symbolic representations that we see so often. The Spirit always being above, matter always being below, and yet each divinely connected as the being of some divine process/design in which the human is caught up.